"El Chavo" redirects here. For other uses, see El Chavo (disambiguation). The show is centered around the adventures and tribulations of the title character—a poor orphan nicknamed "El Chavo" (which means "The Lad"), played by the show's creator, Roberto Gómez Bolaños "Chespirito"—and other inhabitants of a fictional low-income housing complex, or, as called in Mexico, vecindad. Its theme song is "The Elephant Never Forgets" by Jean-Jacques Perrey, based on Beethoven's "Turkish March" Op. 113. El Chavo first appeared in 1971 as a sketch in the Chespirito show which was produced by Televisión Independiente de México (TIM). In 1973, following the merger of TIM and Telesistema Mexicano, it was transmitted by Televisa and became a weekly half-hour series, which ran until 1980. After that year, shorts continued to be shown in Chespirito until 1992. At its peak of popularity during the mid-1970s, it had a Latin American audience of 350 million viewers per episode. The Portuguese dub, Chaves, has been inferred by Brazilian TV Network SBT since 1984, and was also seen on the Brazilian versions of Cartoon Network and Boomerang. Since 2 May 2011, it has aired in the United States on the UniMás network. It previously aired on sister network Univision and its predecessor, the Spanish International Network. It spawned an animated series titled El Chavo Animado. El Chavo continues to be popular with syndicated episodes averaging 91 million daily viewers in all of the markets where it is distributed in the Americas. Since it ceased production in 1992, it has earned an estimated US$1.7 billion in syndication fees alone for Televisa. El Chavo is also available on Netflix in the U.S.
By 1971, Roberto Gómez Bolaños was already well known in Mexico for his self-titled sketch comedy show, which was produced by Televisión Independiente de México and aired on XHTIM-TV, channel 8 (now XEQ-TV channel 9, Gala TV). He had already introduced El Chapulín Colorado and other characters. The cast of the series photograph themselves for a picture in 1979, just after Carlos Villagrán (Quico) left the show. Chespirito is leaning on Chavo's trademark barrel at the center of the picture. Roberto Gómez Bolaños was the show's main creator and star. He called Florinda Meza to act in the show first; Chespirito and Meza later married. Édgar Vivar was the second actor chosen for the show. Roberto Gómez Bolaños recruited Ramón Valdés because he had known Valdés for years and had seen multiple movies Valdés had made. Then, Rubén Aguirre was cast in the show as the character of "Profesor Jirafales". Aguirre and Roberto Gómez Bolaños had been working on scripts together for years, and Aguirre had already been playing the character of Professor Jirafales on another Chespirito show, Supergenios de la Mesa Cuadrada, which spoofed current events panel discussion. Carlos Villagrán just happened to be a friend of Aguirre who was a newspaper reporter, and he went to a party hosted by Aguirre. Villagrán did a comedy step where he blew his cheeks out of proportion, and Aguirre told Roberto Gómez Bolaños about his friend's hidden talent. Villagrán was promptly hired for the show. María Antonieta de las Nieves was a voice-over only actress who used to go to Televisa to make announcements. Upon hearing her voice, Roberto Gómez Bolaños thought she was perfect for the show (she first refused telling him she was not a comedy actress, but Roberto Gómez Bolaños's retort challenged her: "Then you're not a good actress: there are no dramatic or comic actors—there are only actors."). The last additions to the show were Angelines Fernández, a former film actress and Horacio Gómez Bolaños, Roberto's younger brother who had never considered acting before; he was originally to oversee the show's marketing. The first El Chavo sketch was broadcast on June 20, 1971 and featured El Chavo, Chilindrina and Don Ramón. Several "Chavo" sketches produced before the start of the half-hour series were grouped into half-hour segments and are shown before the "official" half-hour episodes in syndication. Many of these were also re-written and re-shot as half-hour-long shows later in the show's life. In 1973, Telesistema Mexicano and Televisión Independiente de México merged to become Televisa. After the merger, El Chavo del Ocho became a weekly half-hour TV series. The early shows were composed of a sketch at the beginning, featuring Dr. Chapatín, El Chómpiras, or one of Roberto Gómez Bolaños' other characters, and two short episodes of the main character. Those episodes were actually sketches filmed in 1971–72 which probably were supposed to be shown on "Chespirito," which was cancelled. After some of those episodes which introduced the first years of the show, the show began to be comprised by an almost half-hour episode preceded by one sketch starring Roberto Gómez Bolaños himself and his characters, as in the first show structure. At the end of the first season, María Antonieta de las Nieves left the show because of her pregnancy. During the episodes of the 1973 season, including those probably filmed in 1971–72, it was noted De Las Nieves generally played the female leads and was the first actor credited after Chespirito. In her absence, Florinda Meza took over the female roles for the non-Chavo del 8 sketches, and El Chavo and Quico became a great comic pair. The 1974 season began with El Chavo and Quico as the comic child characters, including Don Ramón as the charismatic adult character. During that season, the classroom scenes began to appear, alongside other child characters like Ñoño (the son of Señor Barriga, both characters played by Edgar Vivar), Popis (one of Florinda Meza's other characters), and the relaxed Godínez (played by Horacio Gómez Bolaños, brother of Roberto Gómez Bolaños). De las Nieves was given "distinctive" last billing when she returned in 1975. After Valdés and Villagrán left in 1979, she was moved to top billing after Chespirito again. On the hour-long "Chespirito", De las Nieves was often given third billing behind Chespirito and Florinda Meza if playing another character besides Chilindrina, otherwise she always got the special final credit. When Carlos Villagrán left the show, it was explained that Quico had gone to live with his rich grandmother. "He couldn't stand the riffraff anymore", Doña Florinda explained. Not long after, Ramón Valdés also left the series. Chilindrina explained that Don Ramón left the country to look for a job and that he wouldn't return until he was a millionaire. With the loss of two of its major supporting characters, the ratings for the show slid and Televisa cancelled El Chavo on 6 January 1980. Later in 1980, Gomez Bolaños returned with a revived version of Chespirito featuring El Chavo, El Chapulín Colorado and other characters. The debut of El Chavo in this program was auspicious, with a wealth of new episodes being produced. Moreover, in 1981, Valdés joined Chespirito after starring in some unsuccessful shows alongside Villagrán. However, he left again at the end of the year. The number of new episodes started to decline in the late 1980s and early 1990s, so once again, many early episodes were remade. Eventually, Chespirito's age began to catch up with him and it became harder for him to adequately portray some of his characters, especially El Chavo and El Chapulin Colorado. In 1992, at the age of sixty-three, Chespirito retired the El Chavo character from his show (he did the same thing to El Chapulin Colorado one year later). After several years of successful reruns, Televisa launched an animated spin-off of the program in October 2006. El Chavo Animado was produced by Ánima Estudios using 2D and 3D computer graphics. They animated the characters with Adobe Flash. Televisa distributed the cartoon throughout Latin America. The cartoon also allowed depicting the children to the right scale. Previously, since the children were played by adults in the show, the feel was given to the character through their way of dressing, speaking, and mainly through giving them oversized toys. However, this was not the first attempt to animate it. Previous credits sequences featured a claymation animation. The show was dubbed into English by the Dubbing House, a Mexican post-production company. The English soundtrack was recorded at Henckahontas Studio in Burbank California. Villagrán also played Quico's father Federico in the second part of the episode "Don Ramón se va de la Vecindad"
El Chavo is set in a vecindad, a typical Mexican townhouse neighborhood that is owned by Señor Barriga. Señor Barriga is almost always seen in the neighborhood and is usually there to collect the monthly rent from his residents. His best tenants are Doña Florinda and Doña Clotilde, who pay every month on time. His worst tenant is Don Ramón, who never pays his rent and either hides from Señor Barriga until he leaves or uses trickery to waive the payment for later. The sitcom explores, in a comical manner, the problems that many homeless children face on a daily basis, such as hunger, sadness, loneliness, and a lack of adult supervision and attention. On one episode, for example, Chavo was sitting on the stair steps of the vecindad at night, dreaming of all the toys he wished that he could have and how he'd play with them. It ended with him returning to the present, sighing wistfully, then pulling out a balero (the only toy he'd ever had on a regular basis) made of a stick, a tin can, and a piece of string. He begins to play with it as the camera slowly fades out. Some episodes also have educational endings, teaching, for example, that it's good to take a shower and to not judge a book by its cover. El Patio, the central courtyard, is the setting for most of the episodes. Surrounding the patio, are the homes of Jaimito "El Cartero" (from 1982 onwards), Doña Florinda, Doña Clotilde, and Don Ramón. The hallway on the right leads to "el otro patio", the other courtyard, which at times has a fountain in the middle. On the street facade at the left, la tienda de la esquina and a barber shop are shown adjacent to the neighborhood's entry. El Chavo was filmed in a fictitious neighborhood set at studios 2, 5 and 8 of Televisa San Angel in Mexico City. In the later seasons, sometimes an unnamed park was shown. Several episodes are set in Professor Jirafales's classroom, where he teaches, all the child characters in the sitcom attend the same classroom. Others are set inside Doña Florinda's restaurant. Three episodes were filmed in Acapulco, which also served as a vacation for the entire cast. In 1992, the last El Chavo sketches were filmed in Professor Jirafales' classroom. The last sketch for El Chavo was a 1992 remake of Clases de Inglés. The first season (1971–1973) is made of sketches that are approximately 7–8 minutes in duration, except "La Fiesta de la Buena Vecindad" which has a 15-minute duration. The first episodes of the 1973 season, and the last ones of El Chavo in the revamped "Chespirito" show, are 15–17 minutes in length (the rest of the running time is filled by sketches of other characters, mostly of "Los Caquitos"), the later episodes last around 23–25 minutes. Most of the episodes of the 1974 season have a duration of 23–25 minutes, with some exceptions lasting 17–19 minutes which have preceding sketches, or the episode "Termina el Romance" that lasts nearly 28 minutes. From 1975 onward, most of the episodes last 23–25 minutes, after 1974, only three episodes with preceding sketches were made (episodes of 17–19 minutes), all in 1975. Starting in 1976, all episodes have a duration of 23 minutes or longer. El Chavo is a farcical sitcom: it relied heavily upon physical comedy, running gags, literal interpretations, double entendres, misinterpretation (and even, sometimes, elements from the comedy of errors) in order to amuse the audience, and the characters and situations were mostly persistent. El Chavo hits Señor Barriga: Whenever Señor Barriga entered the vecindad, El Chavo would hit him one way or another. Señor Barriga even congratulated El Chavo when he didn't hit him, to which El Chavo would say "You hear that, Quico? This is the first time that I didn't hit Señor Barriga..." and then would turn around, or drop whatever he was holding, ironically hitting Señor Barriga. This was used as a plot device in "La muerte del Señor Barriga", where Señor Barriga faked his death after being hit by El Chavo, in order to punish him for always hitting Señor Barriga when he comes to the vecindad. Mysteries surrounding Chavo: Characters occasionally ask what Chavo's real name is, where he lives, and who he lives with. Every time he is about to answer, there is an interruption and the subject is never brought up again. He mentioned he lived in the apartment No. 8 of the neighborhood (which was never seen in the series) and being called "del Ocho" ("from the eight") for that same reason (note that this explanation was only necessary after El Chavo moved from channel 8, where the series was born). Example: When La Chilindrina asks the Chavo if he lives in his barrel, Chavo says: "But I don't live in the barrel, I live in the house no. 8". And Chilindrina asks him again: "And along with who? "; and when he's about to answer, Quico interrupts him and starts another talk: "Listen, Chavo...". Another example: when someone asks El Chavo what his real name is, whenever the orphan is next to divulge it, someone with another chat or something unexpected interrupts the dialogue and it's not brought up again. El Chavo: He would cry in a high-pitched "pipipipipipipipipipi". In the first ever El Chavo episode, he had a normal human cry but then performed the high pitched cry which would be his official cry throughout the series run. Quico: He would cry in a gargling "Aaaarrgghhh" while leaning on the wall near the entrance of the vecindad. Since Quico always cries on that wall, it has been occasionally referred to as "La pared de Quico" (In english: "Quico's Wall). Don Ramon: He rarely cries, but whenever so, he would provide a nearly high-pitched "Aaaaaaay" while wiping eye to eye in a "screwing a screwdriver" kind of fashion. La Chilindrina: She would pump her fists inward while wailing "Waaaaaaaaah! Waah! Waah! Waaaaaaah! Waah! Wah, Wah, Wah, Wah, Wah, Wah, Wah, Waaaaaah!" She would sometimes scratch her back or massage her buttocks as if someone hit her around that area while crying and menacing her aggressor to accuse him/her of hitting, slapping, screaming, etc. (though some of the accusations could be false). Ñoño: His almost resembles to a bird's chirp. He would wail in an extremely high pitched "Ehi-AH! Ehi-AH! Ehi-AH! Ehi-AH! Ehi-AH! Ehi-AH!" Doña Florinda: She barely cries, but when this happens she does the same as Quico to lean on a wall. Sometimes Quico's cry is heard as Florinda is lip-synching it and in other times an open scream ("Aaaaaaaahhhh!!!") is heard. Doña Clotilde: She rarely cries, but when she does, she sits down with her hands covering her mouth and her cry resembles an owl, "Hoo, Hoo, Hoo, Hoo!". El Chavo getting scared: Whenever something spooks El Chavo out, instead of running, screaming or fainting like the others from the vecindad, he suffers a Garrotera ("the stiffs" or "piripaque" in Portuguese): he freezes into an awkward stance with his knees bent, back slouched, left arm dropping down and right arm hanging out with only his hand dropping downward. The only way to return him back to normal is a splash of cold water on his face. Quico one-ups Chavo: Every time Chavo plays with a toy that he makes himself or has something small, Quico goes into his house and gets a better, bigger and more modern toy that his mom gave to him, trying to outshine Chavo's toys. Quico's 'just desert': Whenever Don Ramón gets mad at Quico for calling him names, trying to get money by doing the same way El Chavo did to him, or by messing around with his face, he sometimes pinches Quico's arm which gets him upset by crying at the wall or by calling his mom. Don Ramón takes the blame: The kids are notoriously mischievous and their games often end in tears (or, more accurately, slapstick). Don Ramón tends to intervene and confiscate the offending "toy" (be it a brick, a steaming iron, a hammer or something else with potential harm risk), invariably at the wrong time: if Quico was at the receiving end, the tearful kid produces a short account (omitting the culprit) for his enraged mother, Doña Florinda. Don Ramón, still holding the main body of evidence, realizes his situation; he tries to explain what really happened to Doña Florinda, but she, with very rare exceptions, doesn't care for his version of the story, soundly slapping Don Ramón. In addition, Quico rarely tell his mom Don Ramón is innocent. The routine includes Doña Florinda's advice to Quico not to mingle with riffraff ("no te juntes con esta chusma"), Quico's victory dance (a comical imitation of a boxer's movements, accompanied by "chusma, chusma", and ending with a mock punch to the man's chest as he blows a raspberry), their dignified stage exit, and Don Ramón's trademark tantrum (throwing his hat onto the ground and jumping repeatedly onto it, regardless of where it lands). Usually, Doña Florinda also tells or advises Don Ramón to commit the same action on his grandma. After this, El Chavo ALWAYS comes and asks him about his grandma, related with the previous event, resulting in Don Ramon feeling offended and answering back by hitting him on his head while saying "Take this!" (producing a bell sound effect), commonly known as a coscorrón (a word similar to the English word "noogie"). Also when El Chavo cries his PIPIPIPIPI sound after being hit on the head by Don Ramon, Don Ramon would mock him by repeating the crying of El Chavo, adding he don't give him another hit because his grandma actually was involved in that situation. Example: after blaming Don Ramón and slapping him because Quico slipped on a banana peel, Doña Florinda says to Don Ramón: "Next time just throw banana peels for your grandma to slip! "; after this, Chavo asks the following: "Don Ramón, is your grandma so slippy? "; the enraged man proceeds to noogie El Chavo in the head, the slammed boy cries and goes to hide inside his barrel, while Don Ramón mocks El Chavo's crying and threatens to hit him again while saying "I don't give you another one only because my grandma was nicknamed Pitty-Butter!". Note: In one chapter, when El Chavo has mud in his hands for the entire chapter, he hits Quico with a watering can; when Doña Florinda comes to see what happens and blames Don Ramón for hitting Quico, for once, Don Ramón can prove he has not hurt Quico and the guilty one was El Chavo, showing the watering can with a mud hand print to Doña Florinda saying "The mark of El Chavo". It is noteworthy that this watering can prop remains printed with the Chavo's hand for the remaining episodes of the show. Doña Florinda and Professor Jirafales' relationship: Whenever Professor Jirafales appears in the vecindad (always carrying a bouquet of roses) and his eyes meet Doña Florinda's, the rest of the world seems to vanish for them, regardless of how conflictive the previous situation: they regard each other in a breathless, stupefied reverie as a fragment from "Gone With the Wind" plays in the background. Jirafales approaches her on impulse (in ballet-like steps) and initiates a dialogue routine, which always ends with him taking her arm and stepping into her house for "una tacita de café" (a cup of coffee). The entire routine is purposefully cliché and overdone, and despite her obvious interest, Jirafales has not gathered the courage to confess. The most Professor Jirafales wants, and struggles with, is to confess he is in love with Doña Florinda, although it is never officially said so. Doña Florinda's son, Quico, always says: "Some more 38 (or whatever number) cups of coffee, and I have a new daddy". Another weird thing is that in Spanish Doña Florinda talks to Professor Jirafales (and vice versa) in the form of "usted", which in Spanish is the usual way to talk to a person older than you, or a random person you don't have the confidence to talk as a known one, or simply for respect to that person. Professor Jirafales also does some very personal attitudes that simple friends don't. For example, he asks Doña Florinda to bake a special cake for him. Once, Quico noticed that Jirafales only ever brought flowers to Doña Florinda, and questioned him about this. After several fruitless arguments, Florinda ended the discussion with her traditional cup of coffee (Quico concludes that Jirafales only gives flowers to Doña Florinda because she only gives coffee to Jirafales). Sometimes, after a conversation or something else that distracted him and Doña Florinda appears, he would accidentally scramble a keyword from the conversation/distraction with her name. Analyzing that kind of behavior, it can assume that this is due to reasons of typical nerves of a person in love. El Chavo's ill-timed last words: when the kids all talk at the same time and an impatient adult (commonly Professor Jirafales) finally demands silence, El Chavo never notices on time, and his last words (often derisive to the adult in question and mostly referring to that adult by a nickname such as Professor Jirafales being "Maestro Longaniza" [Mr. long-sausage]) resound in a suddenly silent room. Example: As a loud chatter takes place, Professor Jirafales says: "Silence... Silence... SILENCE!!! "; and right after the chatter ends, El Chavo talks alone saying such things: "...it all happens just because the teacher has this stupid face!" El Chavo's yes & no response: whenever given a question and it needed either a yes or no, El Chavo would sometimes confuse the others by mixing up the word with the head motions: either shaking his head while saying yes or nodding while saying no. Don Ramon's slipping up words: whenever Don Ramón engages in a conversation with an adult, he would often let words come out of his mouth before he would think about what to say, often resulting as an accidental insult. This mostly happens when he is conversing with Señor Barriga, which he would scramble his name with another adjective. Example: It's a sad barriga, Señor History... Oh, I mean... It's a sad history, Señor Barriga..." (literally: It's a sad Belly, Mister History [because Barriga is spanish for belly]). Adults demanding the kids to leave: several times, as the adults feel offended by some of the kids' actions (mostly Dón Ramón and rarely Doña Florinda and Professor Jirafales), they commonly say the kids to leave the place where they all are (or do something different) by a very comic way. Example: Dón Ramón says: Enough, Chavo! GET OUT OF HERE! Chavo says: But, I didn't do anything! Don Ramon insists: GET OUT OF HERE! Chavo: But I didn't do... [and as the dialogue continues, their phrases get shorter and faster and the talk ends when the kids run out of words] GET OUT! But I didn't... GET OUT! But I... GET OUT! But... GET OUT! ; resulting in the kids' giving up and leaving the place – El Chavo always does it kicking the floor in anger (and sometimes someone's knees) and Chilindrina always cries while fakingly massaging her own buttocks as if someone has truly hit her there (for Chilindrina, Don Ramón usually says "GO HOME!" instead of "Get Out!"). Laugh track - From the beginning to the series's golden period, a laugh track was played to indicate the series' humorous moments. At times, real laughter could be heard from cast members and others present at the set, which made it more natural in comparison. Since the series' eighth season, such track was removed as it was later considered disrespectful to the audience and rather unnecessary. In the series many objects are used as symbols of either the characters of the neighborhood itself. The most iconic of these was the wooden barrel near the entrance of the neighborhood. This was El Chavo "secret hiding place", and most of the characters were unaware that he had an apartment where he lived. A running gag about this is that they believed this was El Chavo's actual residence, which El Chavo was quick to clarify. Other symbols in the series include Quico's ball and other toys, lollipops and balloons which represented the children, Don Ramón's cap, Doña Florinda's curls, Profesor Jirafales's cigar, the flowers of the budding romance of the latter two, Doña Clotilde's broom, etc. The show is the most translated Latin-American show in history, after being shown in several countries. It is the most popular sitcom in the history of Mexican television and lasted for 298 episodes and 316 sketches in the Chespirito show in the 1980s (the 1,300 episode count frequently cited is wrong as it includes all the episodes of El Chavo, El Chapulín, Los Caquitos, Los Chifladitos and other series of Chespirito). It has been rerun on several TV stations since the 1970s. 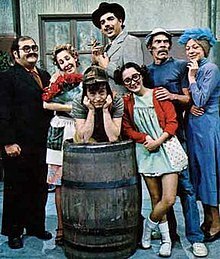 El Chavo del Ocho is also highly popular in Brazil, where it has been dubbed into Portuguese with the name of Chaves, broadcast by SBT; and since the beginning of the 1980s it was the biggest audience at many different times according to IBOPE. This popularity could be attributed to the social and cultural similarities between Mexico and Brazil and the ease of translating jokes in Spanish into Portuguese. In the United States, the show is still shown on TeleFutura and Galavisión as of 2012. The show in the United States is consistently the No. 1-rated Spanish-language cable program. The show was so popular in Latin America and among the Spanish speaking community of the United States that many of the phrases El Chavo and his friends used have become part of the vernacular of countries like Peru, Uruguay, and Argentina. "Chespirito" has established legal battles with former El Chavo del Ocho actors out of a desire to prevent them from using the show's characters in Mexico without his permission. Villagrán moved to Argentina in order to use his character's name on his shows (Chespirito is not copyrighted in Argentina). María Antonieta de las Nieves, however, won a court battle against Gómez Bolaños for the right to appear in Mexico as la Chilindrina. Nonetheless, in 2012, after years of legal battles with Gómez Bolaños, she announced her retirement, complaining that her victories against Gómez Bolaños ended her career, and that nobody would hire her. Currently, the only cast member not to have been threatened with legal action is Édgar Vivar, who also retired his character following gastric bypass surgery. During a visit to Peru in 2008, Roberto Gómez Bolaños told the media that he originally planned to make a proper finale to El Chavo del Ocho: in this finale, El Chavo would die trampled by a car, trying to save another kid. However, one of Bolaños' daughters, who is a psychologist, convinced her father to drop the idea, since according to her, it could depress many children and even lead them to commit suicide. ^ Venegas, Carlos Alberto Vélez, ed. (2002). Televisión infantil: Voces de los niños y de la industria televisiva. Televisión & educación (in Spanish). Convenio Andrés Bello. p. 24. ISBN 978-958-8013-23-7. OCLC 51279443. ^ La Nación. "Roberto Gómez Bolaños apagó una velita por los 40 años del "Chavo del 8"" (in Spanish). Retrieved September 4, 2014. ^ "Versão de Chaves produzida pelo SBT comemora os 30 anos da emissora". SBT. ^ a b "El Chavo del 8 – Historia". Chespirito (in Spanish). Retrieved January 31, 2011. ^ "Adiós al Chavo del 8: murió Roberto Gómez Bolaños". Forbes Mexico. Retrieved November 29, 2014. ^ "El Chavo se muda a TeleFutura". Univision TV. ^ "Horacio Gómez Bolaños" (in Spanish). Chavo del 8. Retrieved 2009-11-16.